MOSCOW (Sputnik) - Russia is working on an amphibious unmanned aerial vehicle, a source in the aviation industry told Sputnik on Wednesday. "There is some groundwork which allows to create an unmanned variant of the amphibious plane. Such works are currently conducted as separate initiatives," the source said, adding that if the Russian military got interested, the aircraft could quickly be produced. In August, Russia's United Shipbuilding Corporation (USC) said that it would built an expeditionary ship, which will combine the functions of an amphibious assault ship and a helicopter carrier. Moreover, Russia is reportedly developing special amphibious assault ships, which would be capable of carrying helicopters, landing craft and amphibious armored vehicles. In May, Russian military equipment exporter Rosoboronexport has unveiled a prototype of the BT-3F amphibious infantry fighting vehicle and the Orion-E, another unmanned reconnaissance vehicle, at the military exhibition in Kazakhstan's capital of Astana. 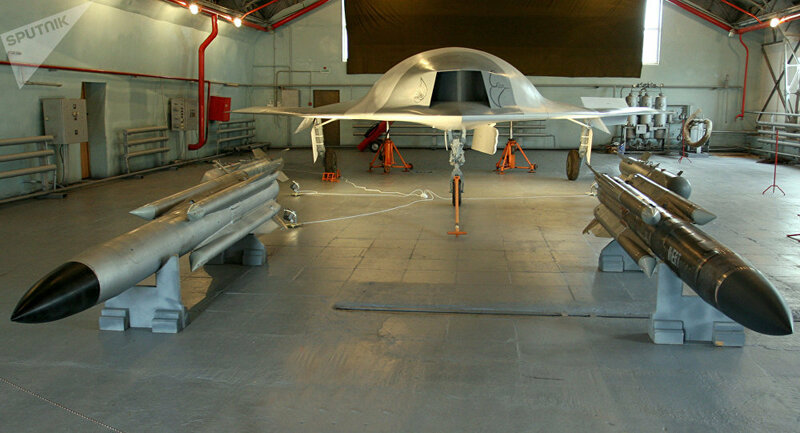 The Orion-E is the first Russian unmanned aerial system (UAS) of medium altitude long endurance (MALE) class developed by Kronstadt Technologies. It has a 16-meter (52.5-feet) wingspan, 24-hour endurance, a 250-kilometer (155-mile) range and a maximum altitude of 7,500 meters (24,600 feet). It is capable of carrying 200 kilograms (400 pounds) of payload. Over the past years, Russia has been actively upgrading its military forces. On March 1, while addressing the parliament, President Vladimir Putin said that Russia had developed a number of advanced weapons, including intercontinental underwater drones, a prospective hypersonic missile and nuclear-powered cruise missiles.